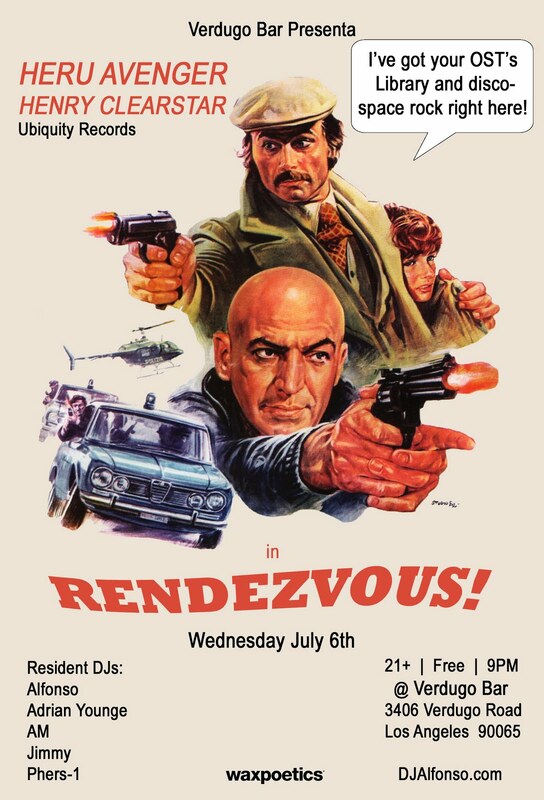 Join us on Wednesday, July 6th as RENDEZVOUS! returns for its next monthly session at Verdugo Bar. This month we are excited to welcome Ubiquity Records' HERU AVENGER & HENRY CLEARSTAR! This promises to be another evening of fine musical selections and we cannot wait to see (and hear) what the Ubiquity boys have in store for the evening. As always, your resident DJs will open up the night with 60's & 70's soundtracks, library, psych, global disco edits, cosmic funk, and groovy sounds from Italian & French lost archives. Two classic giallo & poliziotteschi films will also be screened! HERU AVENGER was a space rock project lead by John Basil from Orange County/California. In his youth he loved Jimi Hendrix, Jimmy Page, Frank Zappa and 'Miles Davis showed me the way as far as attitude and exploring with a menacing quality'. Other factors that shaped Basil's aesthetics include such an avant-garde composer like Karlheinz Stockhausen. His first album under the moniker HERU AVENGER was released in 1998. 'Aeon' contains four long jams beyond the ten minute mark where Basil plays guitar, bass, synthesizer and Craig Teigen collaborates on drums. In 1999 'Magique Mistress' followed, this time recorded with a proper four-piece band including saxophone. Afterwards Basil went on producing music but concentrated on other projects with differing styles. HERU AVENGER means jamming space rock with an avant attitude and jazz ambience comprising a funky note, fusion, krautrock and Berlin School electronics, comparable to Alien Planetscapes in some way. 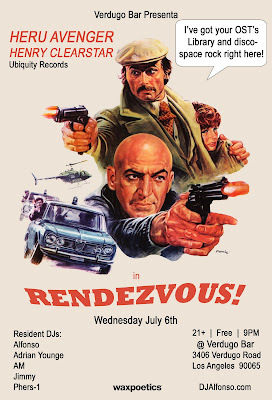 Andy Votel DJ Set at RENDEZVOUS! Andy Votel footage from June RENDEZVOUS!